Syria’s permanent representative to the UN, Dr. Bashar al-Jaafari said that Syria has suffered, during the latest eight years, from a terrorist war in which many governments were involved through supporting, funding and inflaming it. “Those governments have allocated billions of dollars to militarize the situation in Syria and they have created and funded armed terrorist groups that adopted odd slogans,” al-Jaafari added during a UN Security Council session on Monday. He affirmed that some states practice the direct military aggression and occupy others’ territory through force, then they describe the aggression and occupation as “war on terrorism,” they also support the Israeli occupation of the Arab lands. “Since decades, there have been crises that hit our world due to policies of states that create crises and wars to carry out greed and agendas which pose main threat to international peace and security,” al-Jaafari said. He went on to say that the main reason behind conflicts in the Middle East was and still is the Israeli occupation of the Arab territories including the Golan, indicating that all attempts to artificially create new crises in order to save the Israeli entity through obliterating the Palestinian Cause will further increase tensions and escalate threats to international peace and security. “Some governments still politicize the humanitarian aid file in Syria and they falsify information, fabricate evidence and tamper with reports about chemical weapon use in Syria,” al-Jaafari added. He stressed that the US still trains terrorists in 19 occupied sites in Syria including al-Tanf and al-Rukban camp on the Iraqi, Jordanian and Syrian triangle border and it also provides them with weapons and ammunition via 22 US military bases abroad Syria, not to mention facilitations offered to Daesh (ISIS) terrorists to launch more attacks against the Syrian Arab Army. “The Syrian government has never and it will not use any toxic chemical weapons that it originally doesn’t possess after eliminating them onboard US ships in the Mediterranean Sea,” al-Jaafari affirmed. He added that the Syrian people have believed in their Home, independence of their decision and have resisted terrorism and expelled it in large parts of the country. 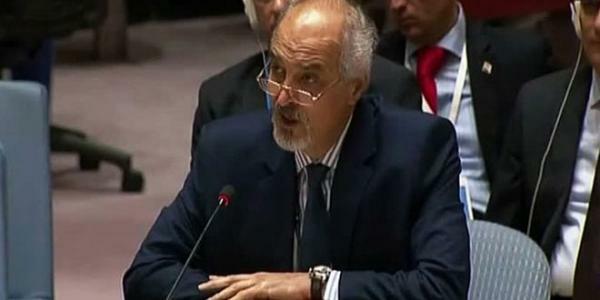 Responding to the statement made by the Turkish Representative to the UN, al-Jaafari said that the Turkish representative has claimed that his country fought terrorism in the north of Syria and liberated around 4000 square kilometers and I would like to remind him that according to principles of the International Law, Turkey is obliged to coordinate and cooperate with the Syrian government in this regard if the former has good intentions to combat terrorism, stressing that no state has the right to infringe on other states’ territories without the permission of their governments. Al-Jaafari noted that the Turkish government hols responsibility for spreading terrorism in Syria, particularly in the northern region, through facilitating the access, funding and training terrorists who came from different countries with the knowledge of the Turkish government and intelligence apparatus, adding that this presents clear evidence on Turkey’s involvement in the crisis which threatens the security and stability in the region. He stressed that Syria will continue fighting terrorism and its supporters across the country and will liberate what has been occupied by the Israeli entity or Turkey. For his part, Deputy Foreign Minister Sergey Vershinin made clear that the de-escalation zone in southern Syria has not been established to maintain the presence of terrorists, noting that there can not be a cessation of combating activities with groups classified by the UN Security Council under “terrorist organizations”. “Despite its obligations, the United States has done nothing to support anti-terrorism efforts over the year that has elapsed since the establishment of a de-escalation zone in southwestern Syria,” he added.